Radio plays an important part in the lives of people living in Albania. Radio Televizioni Shqiptar, the public broadcaster of Albania was founded in Tirana in 1938. 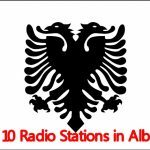 The international radio service includes interesting programs in Albanian as well as seven other languages.